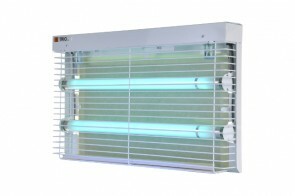 Very sleek and yet highly effective medium-range electric insect killer. We designed the TRIO traps range to answer the needs of e.g. 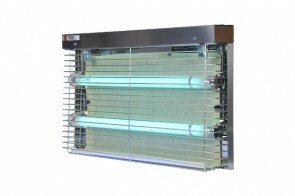 kitchens or shops, which need small and slim steel fly killer. At only 3 kg of weight and 31 cm of width it can be mounted virtually everywhere – and with special detachable power cord designed for these pest control units, the installation is very simple as well. High effectiveness of our TRIO insect trap is ensured by very sizeable glueboard in comparison with two UVA lamps used by the units. The lamps itself are shatterproof while the IP protection rate is 21. By choosing one of the TRIO electric insect exterminators, you get perfect, effective and yet small device to help you with your fly problem. You can pick steel or painted white version to better suit your interior.